Law enforcement just can’t get any love in Clayton County. After dispatching the disaster that was the midget former Clayton County Sheriff, it seemed that all was again right with this dysfunctional county. Troubles continue to mount for former Clayton Police Chief Jeff Turner, who was placed on unpaid administrative leave Tuesday night while officials investigate whether he improperly used surveillance equipment. But Turner’s problems don’t stop there. The commission had compiled a list of a dozen allegations against the way Turner has run the department. Some of the allegations included insubordination, mishandling of sexual harassment complaints against officers, a rash of high-speed chases that resulted in civilian deaths, 138 unaccounted-for firearms and a chaotic evidence room. Have skimmed the headlines on this one, but haven’t had time to dig into it and figure out what’s going on. That said, when Clayton seemed to be disfunctional at every level last year, I asked around for evidence that anyone in their government was competent and productive. Chief Turner’s name was the only name I received, and was told that by multiple folks. In addition, he, at least then, had the respect of other law enforcement folks in the metro area, especially those in neighboring jurisdictions which have to work with Clayton County on a regular basis. Clayton has gotten a lot better. There hasn’t been a server outage in weeks. That damned wp-super-cache is tempting but the site seems much better without it. It is a curious situation, indeed. 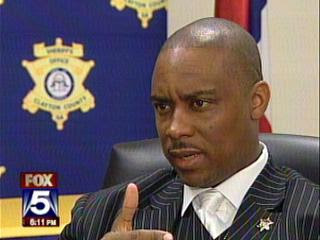 I realize that the bar is set pretty low in Clayton County, but they took a step in the right direction by electing Kem Kimbrough as Sheriff. Anyone who’s worked at the Capitol will remember him as the former Public Safety lobbyist for ACCG. Other than him, I can’t think one other official in Clayton I would trust to even look over my hamster. You have a hamster? You sure you want to admit that in a public forum? I second the Kembrough comment. Best thing Clayton has had in a while. I’ve personally dealt with Kem Kimbrough, and I think he’s probably the best thing Clayton County has going it in local government. Hopefully, he won’t get dragged down by the mess.